I gave it one star because I had to, but it was truly the worst $57 I've ever spent to dine somewhere. My husband and I went to Timsan's, a place whose parking lot is full all evenings of the week and whose funny sayings & quotes on their sign, invite you to explore the restaurant inside. When we arrived we were greeted by a bunch of people sitting at the bar, all of them their backs to us. I heard a "Hello" but I wasn't sure who it was coming from. After the voice asked me for how many, a woman turned around and got up from her bar stool to fetch menu's for us. She was wearing hot pink shorts, a white see through t-shirt that showed her hot pink bra and flip flops that were in one pint in their lives white. She sat us down & took our drink orders. When she brought our drinks, she set down my drink and slid it over instead of either coming around and setting it by me or setting down & just letting my husband pass it along. Left again & came back with a stack of plastic bowls & plates. Yes, plastic. The plastic that looks like ceramic, but it's not. After the rest of our table was filled with other patrons, she took our food order & after 1/2 hr wait, the chef came out to our table. He introduced himself & started chopping & flinging veggies & shrimp left & right. It was fun to see- he clanks the spatulas on the griddle in fancy movement combos, but that's about it. He did the zuchinni, onion & shrimp appetizer and the first bite I took told me immediately I was NOT going to like the food. The taste was of the griddle & sauce he added to the foot. But if I were to close my eyes I couldn't tell you what I was eating. Next the steak, chicken & shrimp, as well was the fried rice. It all tasted the same. It didn't taste like chicken, or steak or shimp. It tasted like the oil/butter he used & the sauce he added. I was truly disappointed not only with the lack of presentation from the waitress but also the lack of taste from the food. The chef probably made a few comments here and there, but no other interaction with us, or the rest of the table. The only good thing about going is that now I know how bad the food/service is, and I won't be tempted or curious to try it. Reservation time was late by 20 minutes. Food was quite delicious and was prepared in an entertaining manner. Waitress was condescending and impatient. Maybe because we were new to the hibachi style of food preparation. I noticed on the menu that tips were shared so maybe she lacked incentive to be pleasant. Menu seemed overpriced for food choices. Dinner area was quite crowded and there was no place to sit at bar. We were stuck against a wall for our pre-dinner cocktails. 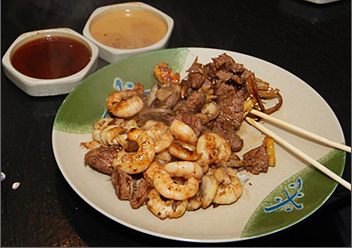 My husband and I went to dine at Timsan's Japanese Steakhouse for some Hibachi style cuisine; it is located on the East side of Green Bay. 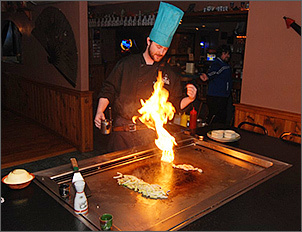 The Hibachi is a Japanese grill with a method of cooking your food in a quick and entertaining fashion in front of you. The chef's are all professionally trained since it is quite an artful presentation for everyone's enjoyment. 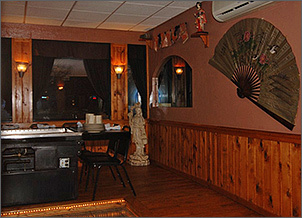 As you walk in there is a large curved bar and the register/ hostess area is located by the front door. The dining area opens next to the bar and is surrounded by large picture windows with views of a busy main street and a side street. The large stainless steel grills were immaculate and held seating for groups of eight or more people. The grills are situated on raised wooden flooring with black padded chairs. The walls in the dining area are adorned with Japanese decor and each place setting is set with blue colored cloth napkins with wooden chopsticks that are artfully folded inside. There was soothing oriental music playing in the background but unfortunately the bartender working this evening was watching the Paula Deen cooking show with the volume turned up so high that I could write down the recipe if I chose to. The waitress was polite and friendly and inquired if we would like a beverage we decided to try sake since neither of us has ever tasted it before. The server explained to us that there is cold sake or warm sake and that the traditional is warm. We ordered the half carafe of the warm sake for $4.75, it was brought out in a small oriental designed carafe with two tiny cups and she suggested keeping the wine warm by leaving it on the edge of the warm grill. The wine was clear in color with a taste of warm strong alcohol, nice to just slowly sip on to warm you up. We then ordered a combination dinner for two for $36.95 which included shrimp, chicken, and steak. Several items are included with the meal: a cup of beef broth, a small side salad, an appetizer of zucchini and onions with rice, mushroom and bean sprouts alongside the main course, and hot tea and vanilla ice cream at the end of the meal. Timsan's was beginning to fill with more patrons so thankfully the bartender turned down the volume on the TV. Our soup was brought out first in oriental designed small plastic bowls. 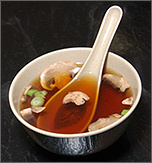 The beef broth was light with a salty flavor with tiny pieces of green onion and fresh mushrooms floating on top. For our next course out came our salads; we had a choice of ginger dressing or ranch I chose ranch, it consisted of iceberg lettuce with some shredded carrots and red cabbage, it was uninspiring. Then our chef Nick came out with a cart loaded with fresh food and cooking supplies. He was very nice and personal and kept up a nice conversation throughout the meal. He started slicing and flipping with quick precision, the food giving off aromatic smells. He then tossed the shrimp tails into the top of his tall chef's hat and one last one in his front pocket, then came the flashy part building a volcano out of raw onion slices he squirted some cooking oil inside the stacked onions and lit it on fire, after the fire went out it started steaming strong just like a volcano what fun! All the grilled vegetables, meats, and shrimp were grilled deliciously with oil, butter some sesame seeds, and soy sauce; everything tasted scrumptious, tender with a lot of flavor. We were given two different sauces for dipping, a mustard sauce for a little heat and a ginger sauce; they were a nice accompaniment for the meal. Then Nick drummed out a tune with his large wooden salt and pepper shakers which made our dining experience very festive. All the portions for the meal were more than adequate and at the end of the meal we were offered the choice of vanilla ice cream or orange sherbet, the server then brought out our sherbet but we were never offered or brought our hot tea. Other than missing out on our hot tea we had a truly delightful and delectable fun dinner at Timsan's.